Chaz Davies celebrates his Race 2 victory. 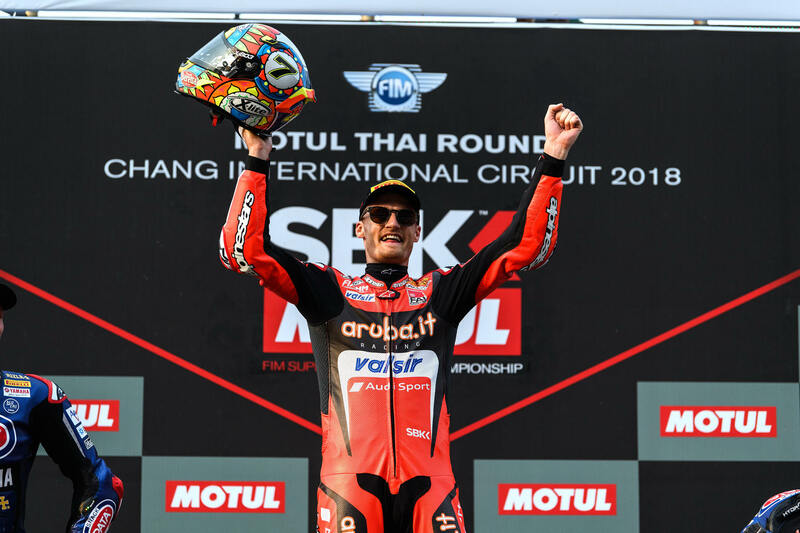 WSB completed Round 2 at the Buriram Circuit this weekend with two different winners and five different riders on the podium over two races. Defending champ Jonathan Rea (Kawasaki) started things off with a victory in Race 1 ahead of second place Xavi Fores (Ducati) and third place Chaz Davies (Ducati). Davies came back to win Race 2 on Sunday with two Yamahas in tow. Michael van der Mark and Alex Lowes took their factory Yamahas into second and third place, respectively. Rea missed the podium by finishing forth. After two rounds, Rea has a slim two-point lead in the championship over Marco Melandri (Ducati). You will find full results to Race 1 here, and Race 2 here. For additional details and points, visit the official WSB site. Excellent races. Surprised Melandri didn’t get on the podium after dominating in the first WSB weekend. If you watched the race, Melandri’s bike was looking like it had a tweaked frame the way it shook at speed. I’d bet they just threw his leathers away. I would have unloaded my bowels having the bike oscillate like that at 190Mph+. Interestingly the other Ducatis aren’t shaking like that down the straights. If it’s a setup issue wouldn’t Melandri’s crew chief just copy Davies’ bike? I reckon that Melandri, being jockey-sized, has the bike set up very steeply at the front to help him turn it, with a resultant instability at high speeds. There was one point in Sunday’s race that Lowes was coming down the straight towards the camera and there was a Ducati either side of him. At the braking point, I noticed that both bikes were Melandri! I wish the organizers could think of something better than reducing the performance of the top teams when they finish on the podium, but I have to admit the racing this weekend was pretty good to watch. Comparing Sykes, who I like and was a champ a few years back, to Rea shows how much of a difference having a bike/rider pair that just gels. Kinda like Lorenzo/Yamaha. Say what you want about that tool, it worked too. Put Rea back on a honda, and the dominance will disappear. Good observation. I remember watching Rea on the Honda. It was borderline ugly. At that time I never would have imagined where he would achieve the success he has. Heck, put him on another team’s Kawasaki and his dominance disappears. Right now, it’s the team he rides on that dominates, and it’s not necessarily because of Kawasaki. None of the other Kawi’s in the field seem to be able to break top-10 consistently.